Okay, so I think I figured out how you can see some of Patricia’s brilliance over at Urban Elementz. Here’s one of our newer pantographs together, Stacked Snailz, the one I used on the little double four-patch quilt. And while I’m remembering to mention it, I started pinterest pinboards on each of the pantographs I’ve worked on so you can see some of the designs inspirations and sources. Here’s the one for this pantograph: stacked snailz pinterest board. The designs are available in paper and digital forms, and if you want a particular custom size printed out, they can take care of it for you. Patricia has a wonderful cheerful staff that’s there to help. 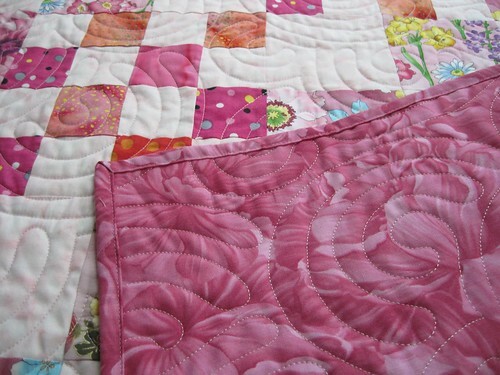 It makes a great quilting pattern on quilts that will get a lot of use and washes, well-balanced and fairly dense.